The Andalusian got its name from the Spanish Province of Andalusia. It was bred mainly by Carthusian Monks in the late Middle Ages. When the Moors invaded Spain in the Seventh Century they brought Barb horses with them. The Barb horse was cross-bred with quality native Spanish stock, and the result was the Andalusian. 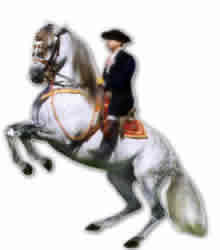 The Andalusian has also been known as the Iberian Saddle Horse, Iberian War Horse, Jennet, Ginete, Lusitano, Alter Real, Carthusian, Spanish Horse, Portuguese, Peninsular, Castilian, Extremeno, Villanos, Zapata and Zamaranos. It is officially known as the Purebred Spanish Horse and has reigned for several centuries throughout the known world as the embodiment of perfection in horseflesh. The famed William Cavendish, Duke of Newcastle, wrote; "…the Spanish horse is the noblest animal in the world…"
Cortez brought Andalusian horses to America to aid in his conquest. Spanish horses have been esteemed for their quality and appearance since Roman times. In the Middle Ages, the Andalusian was the favored mount for European nobles. The Andalusian was a major influence on the Lipizzaner breed in the 1500’s. More recently, it was used as a cavalry mount.